It never ceases to amaze me, the audacity of bookkeepers whoe embezzle money from their clients. In the news story mentioned above, the bookkeeper in reference was even a board member of the little league! The article states that she embezzled approximately $40,000 dollars, but that is just an estimate. It is likely that they will never know the true total amount embezzled due to cash received from concession stands being harder to track. The manner in which she embezzled was to write herself a check, but make it look like a vendor was paid on the books. She ended up being found out when Vendors started inquiring above her head with regards to where their missing payments were. Which leaves me to question; How could she possibly think that the Vendors wouldn't at some point demand the money owed to them and thus she would be found out? How could she steal from a children's league? How could she serve on the board and look in the faces of her peers? Obviously, this woman has extremely poor judgement and integrity. But it just never ceases to amaze me, the audacity of bookkeepers who embezzle money from their clients! 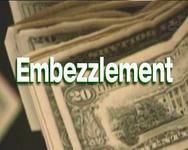 Do you know of anyone who has ever embezzled money? Join in and write your own page! It's easy to do. How? Simply click here to return to Bookkeeping News Contributions.